The date was Sunday, June 26 - my dad's birthday. 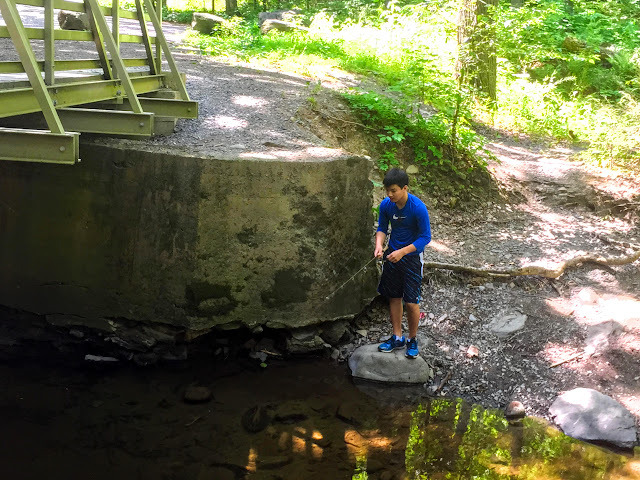 The whole family had decided to go on a whitewater rafting trip in the Poconos, something we had never done before despite the relative proximity. 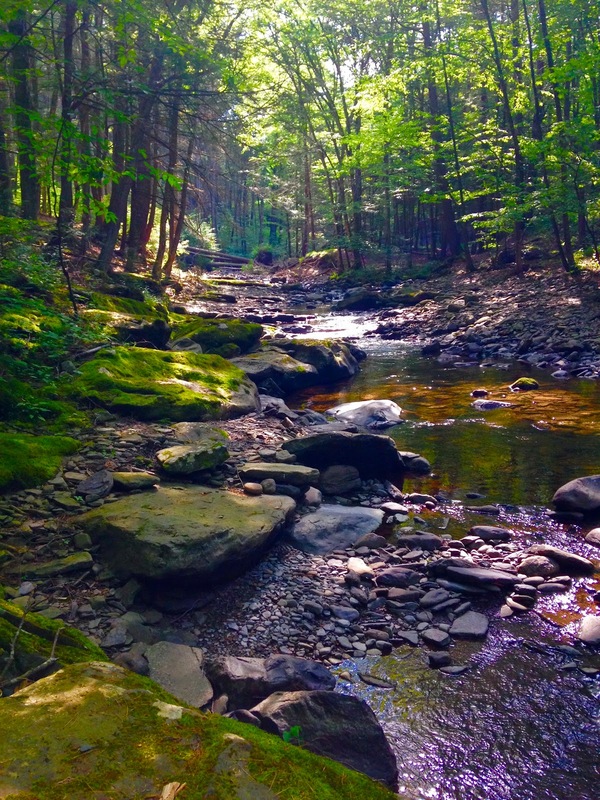 We left on Saturday morning to hopefully do some hiking, since we had never seen the Poconos in any season other than winter. I was planning to get in some fishing as well. The Roughfish June Species contest was almost at an end, and I had a goal in mind for this trip. A true native brook trout was on my to-do list for quite a while, yet down south, there aren't many wild trout streams at all, let alone native brookie streams. In the morning we went on several hikes, the most notably being Dingman's falls. It really was spectacular, but even more interesting were the dozens of large trout sitting right under the falls. I had assumed they were brook trout, but I guess I'll never know because fishing was prohibited. 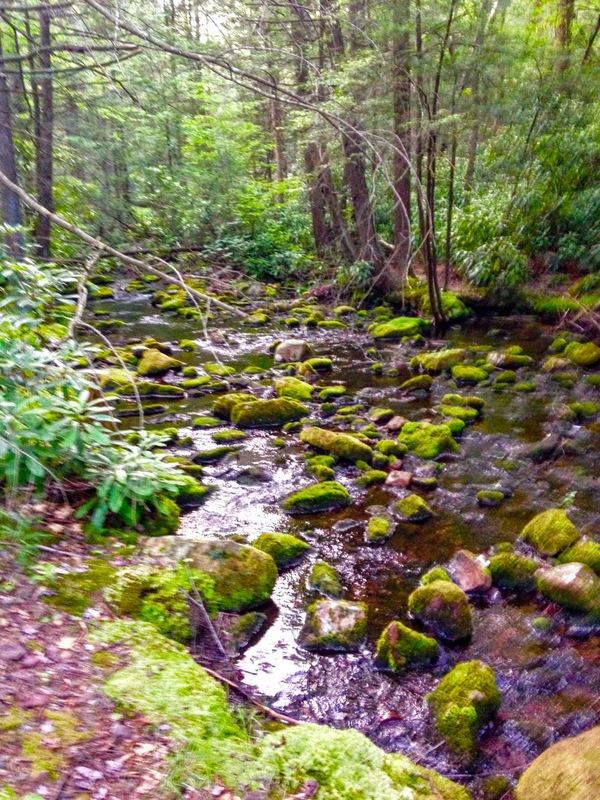 However, a kind park ranger pointed me to a spot were she said there were plenty of trout. I decided to go there while the rest of my family went to another set of falls. Upon arrival, I could see many trout swimming in a shallow pool under the bridge. 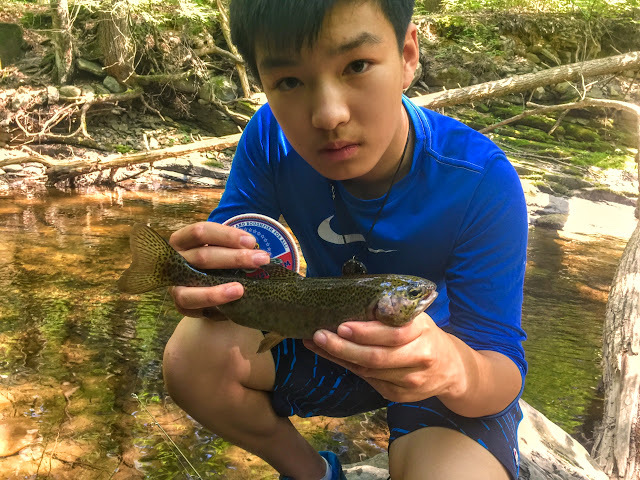 I quickly hooked a large stocker brown trout that got off the hook and swam off. Even though these were stocked trout, they were quite wary, possibly because of fishing pressure and the super low and clear waters. I was fishing a freelined mealworm and they were not having anything to do with it. A small rainbow eventually made a mistake and I landed it, although stepping in a batch of poison ivy. Whatever. It seems as if I've almost developed a resistance now. The rainbow was something I knew was possible, but wasn't really expecting. Nonetheless, I'll take a new contest entry. As I was reeling the mealworm in, I got a hit from a minuscule, striped fish. I stopped to let the fish fit the whole bait in its mouth before setting the hook. I pulled it up and found a teeny yellow perch on the end of my line. I laughed. 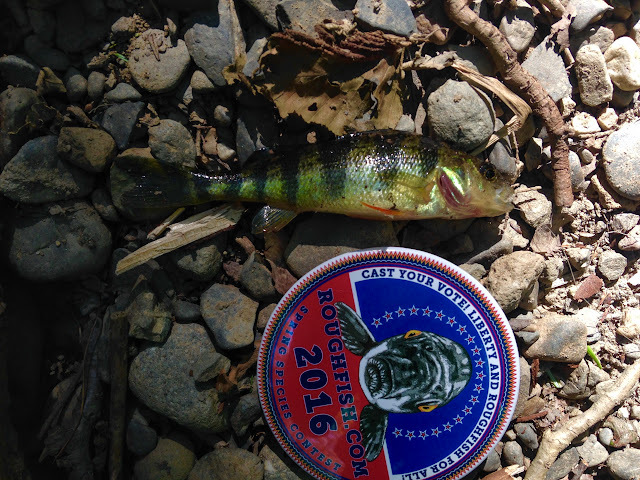 Kyle, while I was in MN, caught a yellow perch from a slow moving trout stream, but I had just caught one in a freestone mountain creek! Another unexpected entry. You may be able to understand the hilarity if you take a look at the creek below. After a while, some bums came and tried to literally spear the trout I was fishing for with sharpened branches. After I told them that was in fact illegal, they came back with heavy fishing rods with bass lures and started tossing them around with reckless abandon. They also jumped into the water, which had a max depth of around two feet in that tiny pool. That was the tipping point. I headed upstream, and got a hit from a small trout that came off. 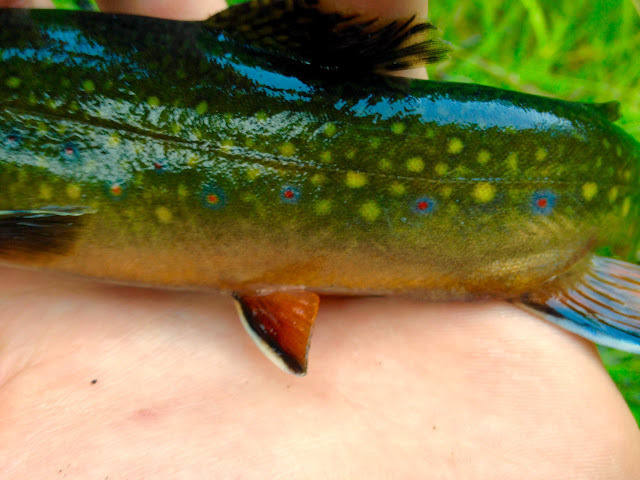 It might have been a brookie, I'll never know. I had one spot that I really wanted to fish from the start, a tiny run that apparently had a very abundant population of native brook trout. The stream was so small, it wasn't even on Google Maps! The day was getting late, and we didn't have much time left, since we had rafting early the next morning. I convinced my parents to go, so they went on another hike while I checked out the trickle of water. There was only one "pool", about 5 feet wide and 1.5 feet deep. 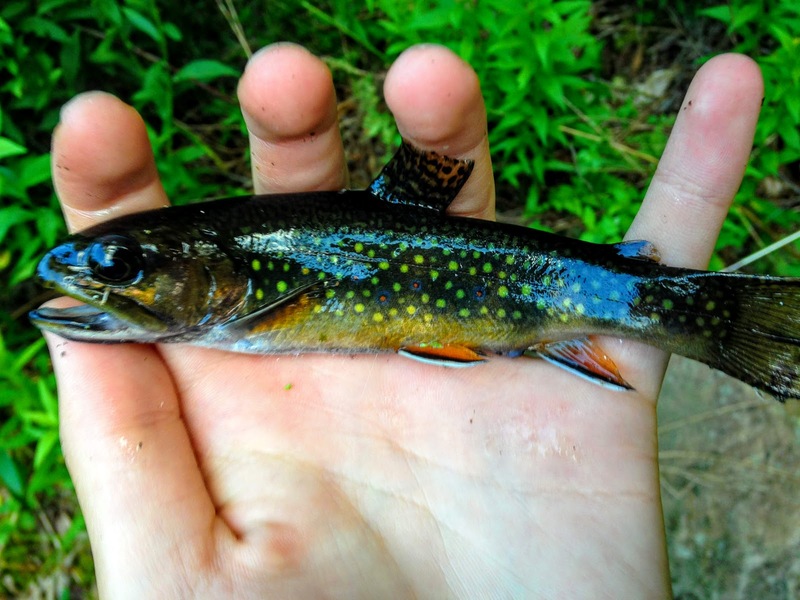 I glanced into the amazingly clear and cold water and saw brook trout. 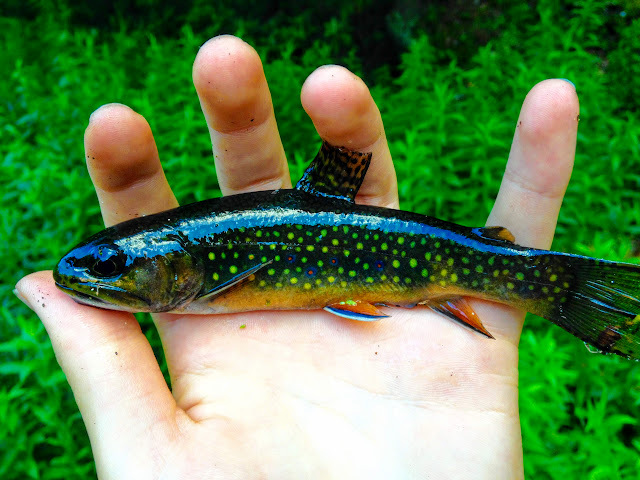 Real brook trout, ranging from an inch to a bit larger. This is what I had come looking for. I hid myself in the tall grass and freelined a mealworm. At first, the fish spooked, so I crouched down and sent a cast between two large rocks in the middle of the pool. The only problem was, my ultralight, although being ultra light, was not built to cast a basically weightless mealworm by itself. It took me several tries to get it in the right spot, and as soon as I did, a dark shape rushed out and I tightened up. 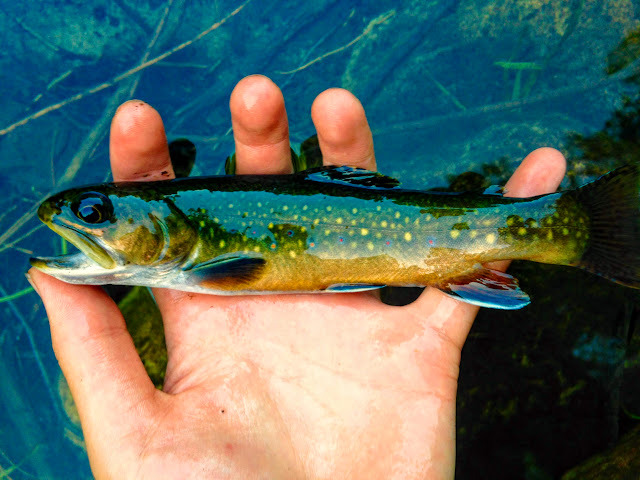 I brought to shore a small brookie, almost black. But it radiated a bright orange belly and beautiful fins and spots. Success! I had several hookups, but it was tough keeping them pinned with my rather large hook. 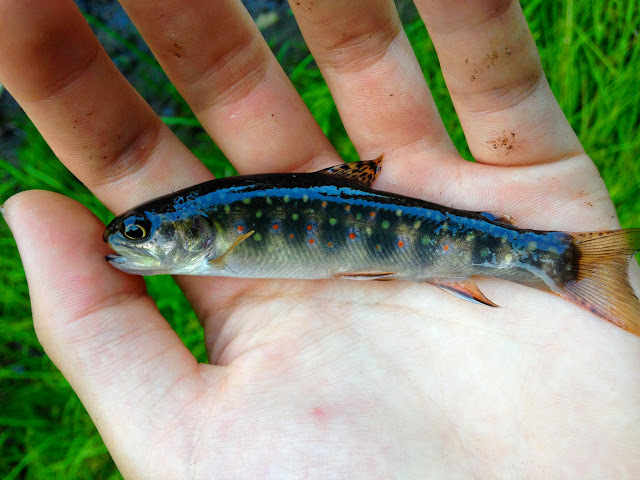 Finally, I connected and brought up a bluish specimen that lacked a red belly, but had gorgeous red and blue spots. That water is MAX 6 inches deep. I returned to the little pool and had several juvenile specimens chasing my mealworm as it slowly drifted along. They would just nip the tail end, however, so hookups were scarce. But eventually, I brought one in, a silvery little guy, beautiful in its own way. 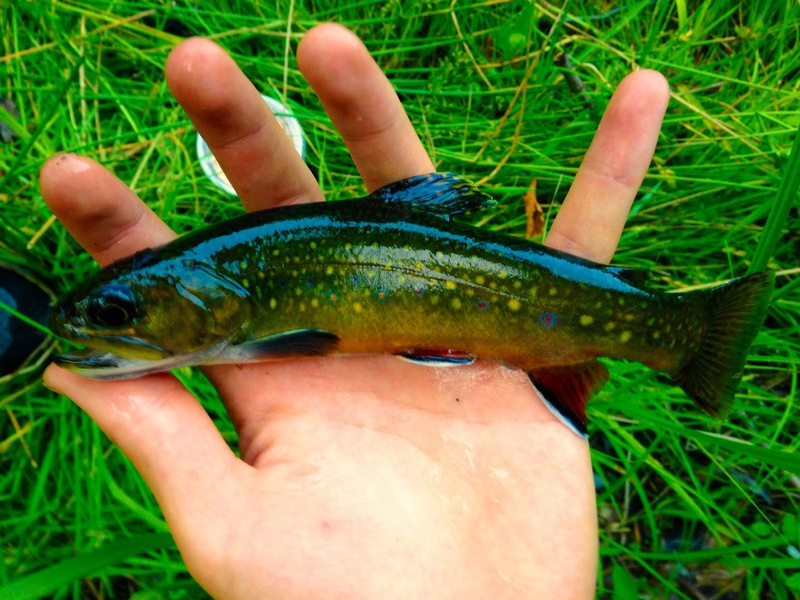 Brook trout are just so amazing. 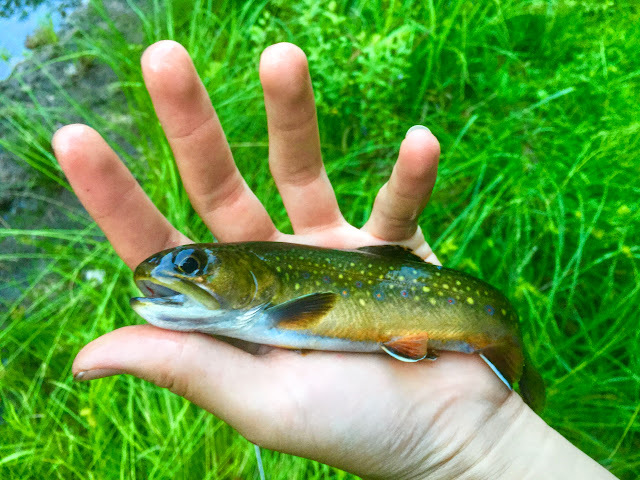 I had only an hour to fish, and my parents had just finished a short hike, so when my mom came to pick me up, I declared that this was my last cast. I cast perfectly, and let the mealworm sink slowly to the bottom in the current break behind the rock. There was a little bit of sunken wood and leaves there as well, and suddenly a larger shape darted out from under the cover and grabbed the motionless bait. 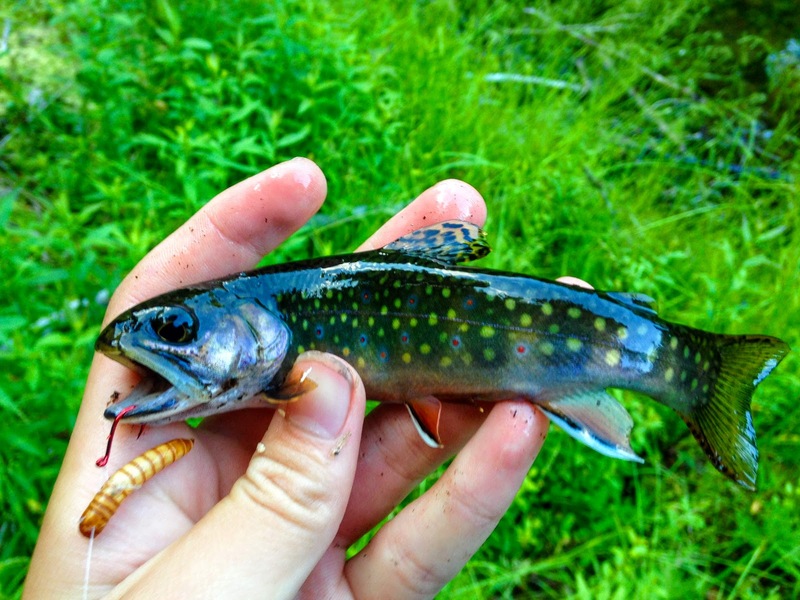 This was a fish I had gotten to bit before, but failed to hook. 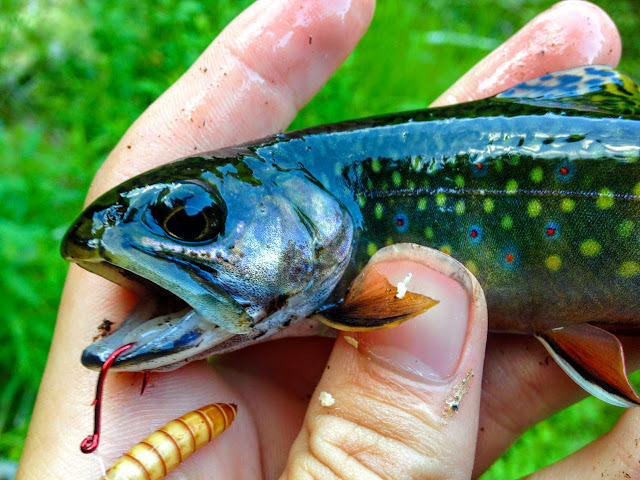 This time, however, the hook stuck, and I found a feisty brookie at the end of my line. 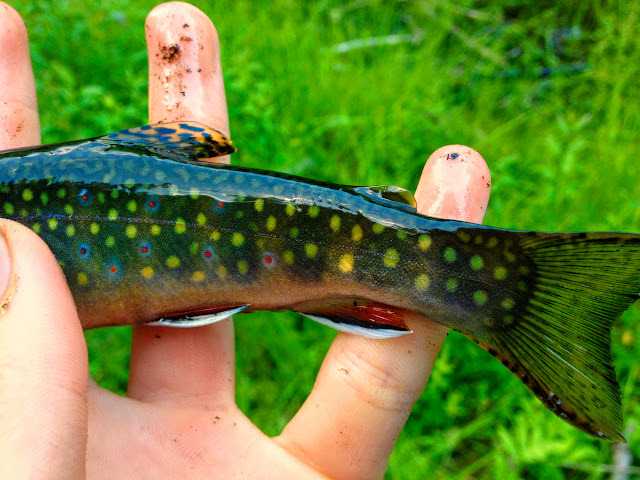 This fish was by far the best brookie, maybe not the most colorful, but definitely the largest and most pristine specimen. I can nott wait to fish for him again in the fall when he's all colored up! I watched that prime fish swim off and called it a day. 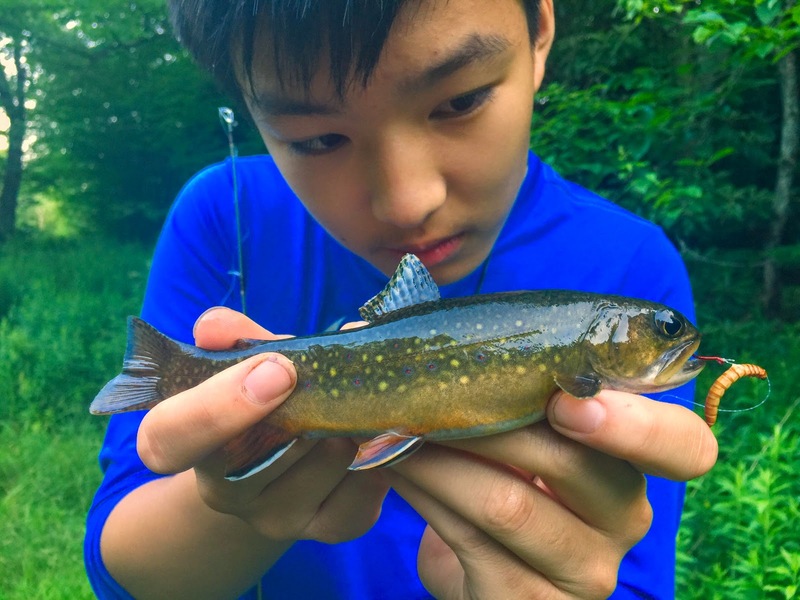 I had finally found the native brookies. The next day was full of exhilarating adventure, and I could rest easy knowing that I had accomplished and exceeded my goal.